McAfee is offering a free one-year subscription for its VirusScan Plus product. If your antivirus software is expiring soon or you want to try an alternative, then the price is definitely right. The offer expires December 31, 2008. A firewall and spyware protection are also thrown in with the antivirus. 2. Enter VSPPROMOCF into the promo code box and hit Submit. 3. You should see the $39.99 charge zeroed out, but you'll also see a CD added to your order. 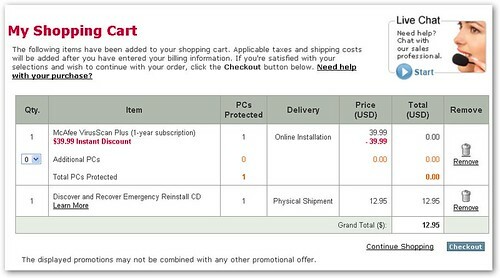 Click Remove to delete "Discover and Recover Emergency Reinstall CD" from your order. 4. Click Checkout to receive your free McAfee download.